You might think that efficient, highly functional, and beautiful custom closet design begins with space planning. But you would be wrong. It begins with a purge. Most people have clothing and other items tucked – or stuffed – into their closets that they haven’t touched in a year or more. Donate or discard all of those out-of-style, unneeded and unwanted items before you begin the closet design process. In doing so, you will best understand not only how many items you have, but what types. Even if your result is a few steps down from a boutique or haberdashery style space – for which we advocate – an accurate “audit” of what needs to fit back into the closet is the only way to plan a space tailored to your needs, whether you are designing a walk-in or reach-in closet. Consider making a built in “hutch” the centerpiece of your new closet, complete with drawers, a catch-all surface on top, and shelves or cubbies above to save space in the bedroom by eliminating the need for a dresser. Then build out from there, thinking in terms of zones, especially if two people share the closet – or might in the future – and designing from the floor to the ceiling to make use of every square inch. No closet ever had too much storage space. Decide what might be better folded or rolled, like sweaters and T-shirts – clothing made of fabrics that can stretch and become misshapen – and even jeans and shorts. Allot adjustable shelves – and maybe some handy rollouts. These could be cubbies or deep drawers. For ease of retrieval, it is best that folded items are not stacked more than 5 feet tall. The top shelves of your closet are the ideal place for bins that hold less frequently used items like luggage, totes and shoe bags for travel, or seasonal items like bathing suits. Drawers with clear acrylic fronts make it easy to see what is inside, but may also contribute to visual clutter. Figure out which matters more to you and choose accordingly. Shallow drawers are nice for hosiery, underclothes and nightclothes, though some people prefer an open bin or basket on a shelf for quick retrieval of these items, especially, socks. Those slanted shelves designed especially for shoes are not the most practical, adaptable or space-saving design. We recommend flat adjustable shelves to accommodate shoes of different heel and platform heights, as well as booties and boots. Save the most space by turning each pair heel to toe. Other items requiring shelf space that you might want to stash in your closet include linens and pillows for the adjacent bedroom and bath. Clothing on hangers takes up the most space, but is, obviously, a necessity. Measure the width of your hanging clothes to determine exactly how much space you will require. Be sure to include long hanging space – usually some 18-24 inches in width – for women’s dresses. Consider hanging coats in a foyer or mudroom. Most everything else can be double hung, but it is still a good idea to make sure that rods are adjustable. 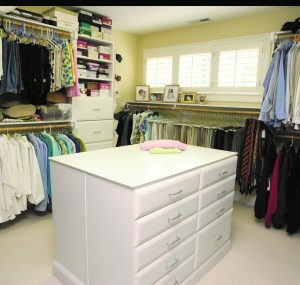 In a walk-in closet, hanging clothing can be concealed behind doors for a very upscale look. Just keep in mind that they will take up more space and, unless the area is expansive, could lend a closed-in feel. For the neatest, tidiest and most cohesive look even without doors, decide on one type of hanger – plastic, wood, or velvet; not wire! – and stick with it. An array of other closet accessories is available, and one can easily get carried away. One that is practical, though, is a pull-out belt/tie rack. Another that we really like is the pull-out hamper located in the bottom section of double hung space. If two people share a closet, each person ideally will have his or her own hamper or, even better, a pair of them for separating different fabrics. We favor the bag-style that can be unhooked from its sliders and taken to the laundry room. If your closet offers enough wall space – including behind a swing door – where anything built out will not work, many women, especially, like a rail-type system with hooks for jewelry, scarves, hats and the like. Being able to see all of your jewelry hanging over hooks or in organdy bags suspended from hooks means it is likely to get worn more often. Lighting is as important in the well-designed closet as it is in a kitchen and bath. If you can accommodate natural lighting from a window, we highly recommend it, though some fabrics can fade in direct sunlight. Because you lose storage space on window walls, we find that the space beneath windows is the ideal spot for bench seating for putting shoes on and taking them off. A small sturdy bench that doubles as a kind of movable step stool is nice for retrieving items up high. But you will also need overhead lighting, which can be as stylish as you choose; just make sure it is bright and not behind you, or your body will cast shadows on what you are trying to see. Opt for a cool type of bulb, as incandescent light fixtures can cause heat to build, and all of that fabric in an enclosed space can become a fire hazard. Other considerations for your closet, if space allows, include a television, radio, flip-down ironing board, full-length mirror from which you can stand back about 3 feet, and wastebasket for laundry tags and bags, receipts left in your pockets, and the like. Closets can be difficult spaces in which to vacuum, but area rugs underfoot can feel nice. By keeping these guidelines in mind, your closet may become the best room in your home. If you have a question on building, remodeling, or designing your dream closet, please email me at chris@ vbhomesliving.com. 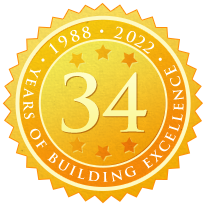 The VB Homes Team is proud to celebrate 30 years of offering homeowners construction and design excellence. With every project completed, we add to our growing family of satisfied homeowners and our ongoing mission to provide comfortable, affordable living. Get the latest VB Homes news sent to your inbox!